You know those cool floors—the ones that look amazing and add layers of character to a room. The ones made from natural stone and exotic hardwoods. You know, the ones that don't belong in bathrooms or basements because the water might ruin them. 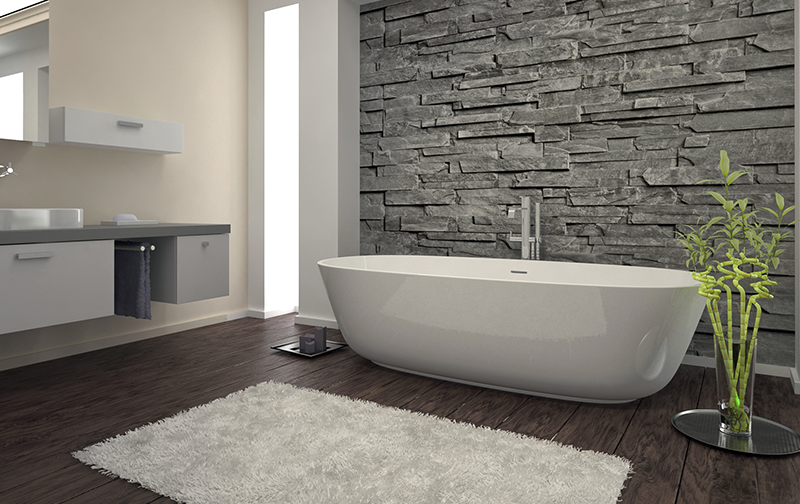 Have you ever imagined what it would be like to have a hardwood floor bathroom? How about stone tile? Now you can. Resilient flooring replicates the look of both hardwood and stone tile, without the worries of water damage. Resilient flooring is a fairly new flooring group. It gives you a hard surface floor that’s extremely durable and stylish at an affordable price. Resilient flooring comes in two categories: luxury vinyl and waterproof composite flooring (WPC). Both come in a variety of design options, including planks and tiles. Not only do they look like natural materials, they feel authentic as well. They feature an embossed surface that replicates the texture of natural materials. It is a durable surface that does not wear down over time because of its clear protective layer. Waterproof composite flooring lets you pick the look you’ve always wanted in a bathroom because WPC is designed with interlocking technology that prevents any liquid from penetrating the floor and subfloor, even in the event of an natural disaster like a flood. Choosing this 100% water resistant flooring option means you don’t have to worry about moisture-related problems—ever. Does it have any other advantages? When you start planning to remodel your bathroom, consider an accent project using glass tile. Glass tile’s natural water resistance makes it a perfect for creating a backsplash. Glass tile can make a big difference in a bathroom. It can capture light and make the space come alive and feel larger, more open. Ready to upgrade your bathroom flooring? Kermans Flooring has a large variety of resilient flooring options in dozens of colors and designs. We have specialists to help you throughout the entire process. Stop by our showroom and let our talented design consultants create a custom plan for your bathroom. Learn more and schedule a free consultation.